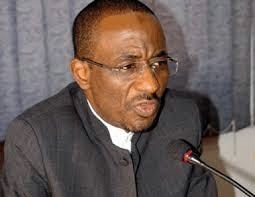 The Nigerian President, Goodluck Jonathan, has suspended Mr. Sanusi Lamido Sanusi from his position as the Governor of the Central Bank of Nigeria. The suspension was announced in a statement signed by the Special Adviser to the President on Media and Publicity, Dr. Reuben Abati. “Being also deeply concerned about far-reaching irregularities under Mallam Sanusi’s watch which have distracted the Central Bank away from the pursuit and achievement of its statutory mandate; and being determined to urgently re-position the Central Bank of Nigeria for greater efficiency, respect for due process and accountability, President Goodluck Ebele Jonathan has ordered the immediate suspension of Mallam Sanusi Lamido Sanusi from the Office of Governor of the Central Bank of Nigeria. “President Jonathan has further ordered that Mallam Sanusi should hand over to the most senior Deputy Governor of the CBN, Dr Sarah Alade, who will serve as Acting Governor until the conclusion of on-going investigations into breaches of enabling laws, due process and mandate of the CBN. “The President expects that as Acting Governor of the Central Bank, Dr. Alade would focus on the core mandate of the Bank and conduct its affairs with greater professionalism, prudence and propriety to restore domestic and international confidence in the country’s apex bank.